I wrote a couple of weeks ago about cycling students around Honey and Mumford’s learning modes [See ‘So how do people learn?‘ on June 20th 2018] without explaining how this might be achieved in a lecture course. The first step in the cycle is having an experience, which is difficult for a student in a lecture theatre with dozens of other people. A demonstration by the lecturer does not achieve it because the student is not doing and feeling. So, how can the first step be achieved in a traditional engineering lecture course? Well one answer, for introductory courses, is to exploit the everyday experiences of the students by choosing something that they will have done for themselves, preferably more than once. It can be useful to perform a demonstration at the start of the lecture to engage the students and remind them about their own experience. All of the lesson plans provided on this blog start with this kind of activity [https://realizeengineering.blog/everyday-engineering-examples/]. The lecture can proceed to reviewing the experience and building a new context around it, i.e. the engineering principles that are being taught. It might necessary to review the experience in several different ways and make a series of connections to it. 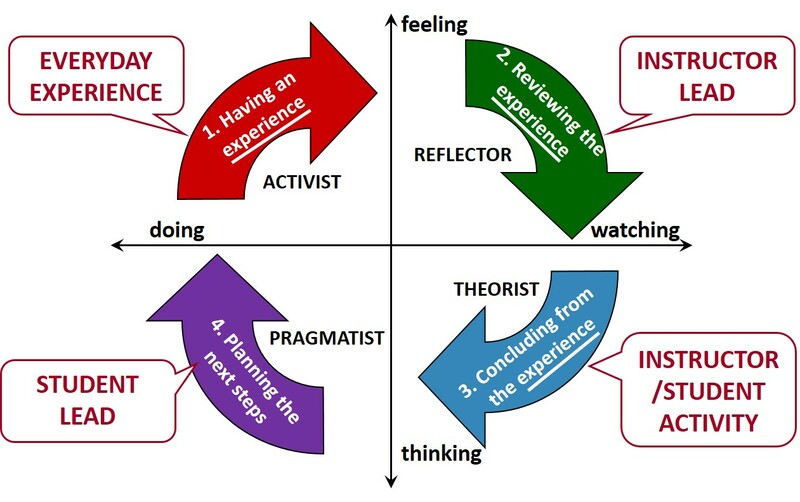 I recommend that the third step: concluding from the experience, should be a student activity guided by the instructor – perhaps a piece of homework that leads the student to take the fourth step on their own, becoming a Pragmatist by planning their next steps. Doris Lessing, Nobel Laureate for Literature, in ‘The Four-gated City‘ wrote ‘That is what learning is. You suddenly understand something you’ve understood all your life, but in a new way.’ Understanding an everyday experience a new [engineering] way is what we are trying to achieve. This entry was posted in Creating A Learning Environment (CALE), education, Engineering, everyday engineering examples, Real life and tagged 5Es, Doris Lessing, education, Engineering, formative experiences, learning environment, Learning modes, learning style inventory, learning styles on July 11, 2018 by Eann Patterson.